This week felt like a banner week as I crossed off many of my to-do’s and felt quite accomplished doing so. These weekly link-ups have really taught me the importance of counting each task (big or small) as a victory. Here are a few of my victories this week. Cleaned tubs, showers, sinks and toilets. I dread cleaning bathrooms so I was glad I cleaned the 3 in our house. I even tried some all-natural recipes that I hope to share on the blog soon. I used a combination of water, vinegar, baking powder and lemon juice to scrub the bathtub. It worked really good, but I’m still trying to tweak the recipe. Would love to hear your suggestions. Exercising is something I enjoy, but the challenge sometimes is finding the time between my already hectic schedule. I made it to the gym 3x this week plus I ran outside on the greenway trail, it was a beautiful day, perfect for my first outside Spring run. I participated in a parent/child activity at my son’s preschool. Safari Day was a blast as Liam and I made a craft, shared a snack, and I watched his class sing some wild songs. I met with my friend, Allison and learned more about her social media sharing site- KidDilly. We discussed her vision to expand the site’s territories and reach more parents. Blogging. I wrote another post about healthy snacking- Cucumber Water . I have also been working on some upcoming posts- Mom Shortcuts and a review of a new Brixx Pizza. I finished the t-shirt design for Team Fit Triangle Mom and started selling tees and tanks in an effort to raise funds for the Susan G. Komen Race for the Cure in June. Unfortunately, I found out another friend of mine has been diagnosed with breast cancer. She is already scheduled for a full mastectomy, reconstructive surgery, and chemo and radiation treatments. My heart really went out to her and her young children when I heard her news which motivated me to push even harder to raise funds for the Race this year and support breast cancer fighters. Click Here to learn more about Team Fit Triangle Mom. What about you? I’d love to hear about your Small Victories this week. Share them in the comments as a way to encourage others. Be sure to also link up to the linky below. Each week my co-hosts and I will feature our favorite bloggers from the previous week’s linkup. Visit each of my co-hosts to see who they’ve featured too! Stop by Mom’s Small Victories to see who earned the Reader’s Choice for Featured Blogger. If you’re chosen, please grab the code above and display it on your blog. The featured blogger this week is from Kristen of Mommy in Sports and her post Please Stop Calling Me Supermom. I admired Kristen for authenticity as she explained that even a mom-blogger, sportscaster, and baking nerd can forget school forms, showering and taking a deep breath before yelling at the kids all in the same day. This post resonated with me that even while I take on an overwhelming amount of responsibilities; I am no where close to being a Supermom. Congratulations, Kristen on being the featured blogger this week. Grab the code above and display it on your blog. Be sure to visit my Featured Blogger board on Pinterest. 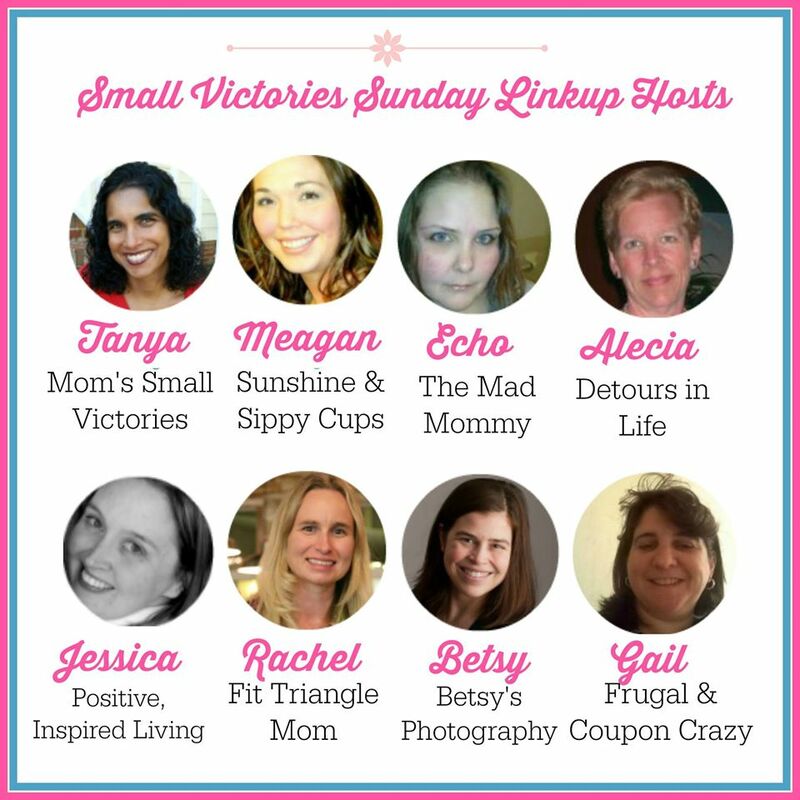 Follow FitTriangleMom’s board Featured Bloggers- Small Victories Sunday on Pinterest. Thank you so much for the kind words! I’m so touched by what you wrote and love linking up with you each week. I’ll share this and thanks for all you do! Thanks for sharing the link up. Your post was an inspirational message that more moms needs to hear!